Chloe is excited about spending her senior year of high school in California with her friend Jake's family. Even the usual dread of being the new girl can't bring her down. That is, until she stumbles across the dead body of the most popular girl in school, Lora Kelly. Now she's receiving threatening notes...will she be next? 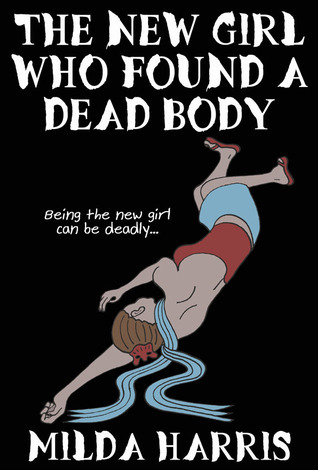 The New Girl Who Found a Dead Body was everything i expected it to be. It was such a fast paced thriller, i loved it! Milda Harris is such a great story teller that i could easily see everything that was described in my head, and you could easily feel the anticipation that Chloe was feeling. At one point i had to stop about half way through and was scared to walk through my house to get something to drink. Although there was a lot of scary, thriller moments there was enough subtle romance to balance it out. I really liked that the romance didn't over power the story. There was enough to make your heart swoon, but a small amount where you still remembered there was a killer on the loose and that that was the main focus. The story couldn't have gotten better. The characters were awesome! Chloe was great, she was very upfront and went after whatever she wanted and definitely didn't have a filter. She was very courageous and knew what to do in high stress situations. She was the only one who was able to calm down and find a solution. She was definitely not your typical horror movie female lead who when being chased falls down. I was very thankful for this, because i was really scared that she would do something dumb and i would want to kill her, but that thought never crossed my mind. Kate was the perfect jealous girlfriend, she was mean and manipulative. Jake was an awesome best friend. He reminded me of a protective big brother and i loved it. Finally Grey, my favorite male character, was the perfect heart throb. I loved him very much. I really loved the ending conclusion. It came out of nowhere and the killer was someone i never would have suspected. Very tricky Milda Harris! Even though you knew you were getting toward the end of the story you didn't know when you would find out who the killer is. Milda Harris waits till the very, very end to reveal it. I honestly thought it was going to turn into a series and that i would have to wait till the second book to find out who it was. I completely loved this story! I wouldn't change a single thing about it. The characters were great and the balance between romance and mystery was perfect. The romance didn't over power at all which i really loved. If you are looking for a good murder mystery this is definitely the choice for you, and dont worry you wont figure out who the killer is until its revealed, which i loved. Fantastic job Milda!